WHY CHOOSE TULSA FOUR SEASONS? Tulsa Four Seasons is a full service, factory trained and nationally recognized sunroom design studio where your designer starts the process by taking photos of your home and your yard and then creates both sun studies and virtual renditions of how your new room will look on your home. They will design your space based on the way you want to use it, the style of furniture you choose to have in it and how you want it to interact with the rest of your home. After all, your new room should be that special place; the space you never want to leave! A Four Seasons sunroom is a space that maintains energy efficiency and has passive qualities while at the same time, offering you a light filled place in your home of exceptional value and quality. It’s one of many reasons why a Four Seasons Sunroom has been the preferred alternative to an ordinary addition for almost 40 years. Enjoy comfort, safety and peace of mind in knowing Four Seasons offers fully transferable, industry leading warranties on their fully tempered and patented CONSERVAGLASS SELECT, a glass designed specifically for climates like Oklahoma. With hundreds of design options, we are able to design a room for you that not only fits the climate, it also fits the budget. 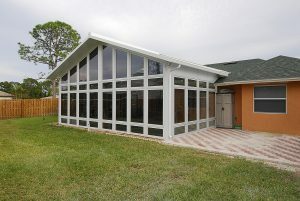 Why a Four Seasons Sunroom?